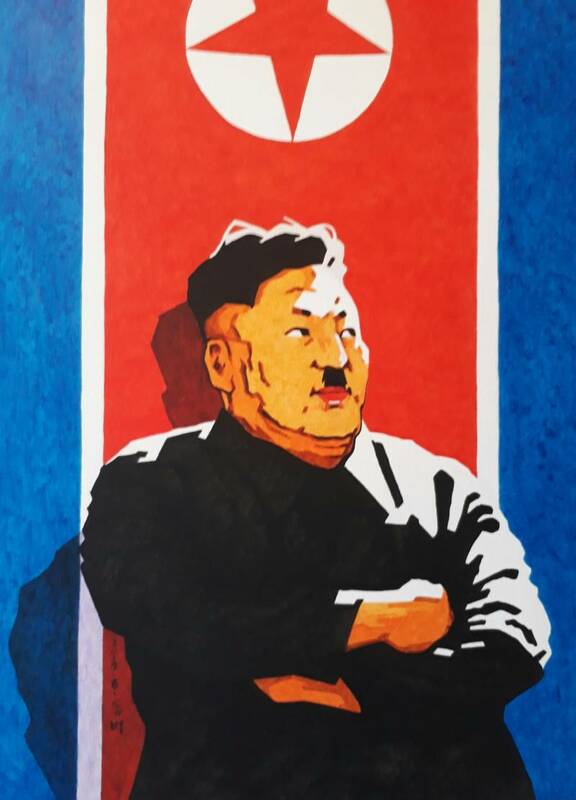 A North Korean artist who used to churn out propaganda posters celebrating the Pyongyang government is now exhibiting art in San Francisco that does the exact reverse. 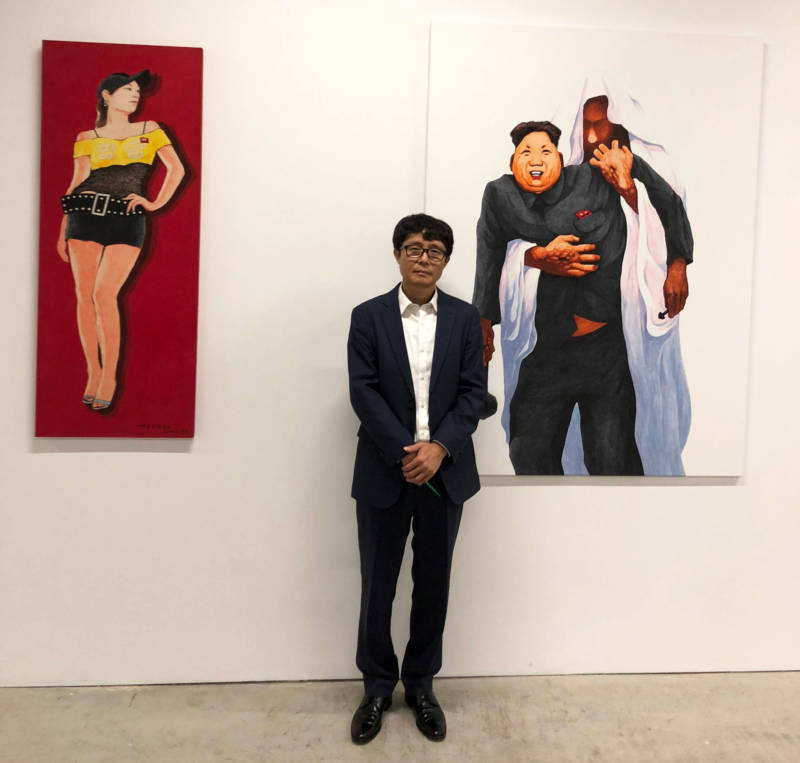 North Korean leader Kim Jong Un figures prominently in the 34 bold acrylic paintings that make up Song Byeok's "Longing for Freedom," an exhibition that opened Thursday at the Minnesota Street Project. Kim Jong Un's face sports a Hitler mustache in several pieces. 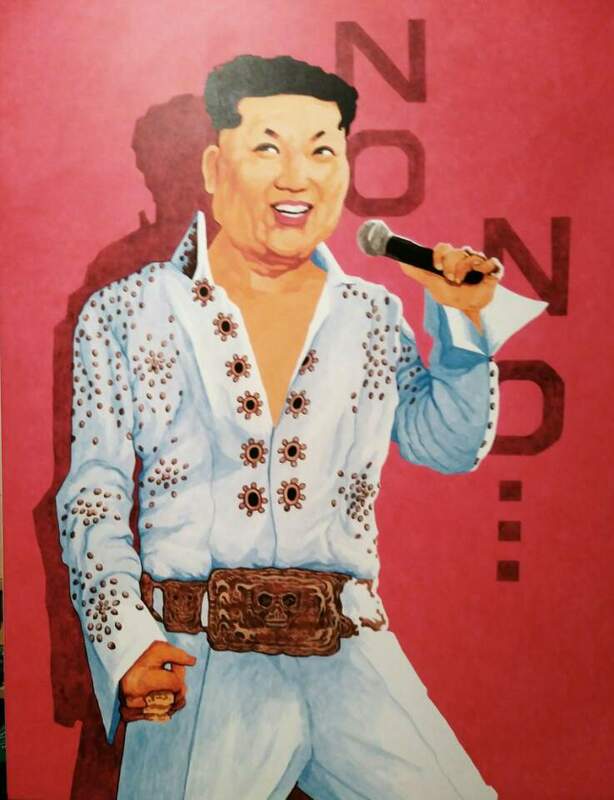 In another, "Show of Dictator," he grins atop the body of a rhinestone Elvis. "Elvis was revered for his musical talent and his performance, and he was very respected," Song told KQED through an interpreter a few hours before the show opened. "Kim Jong Un, on the other hand, is a horrible dictator that kills his own people." Song, who currently lives in Germany, doesn’t need to convince most Americans of this point of view. Still, exhibition curator Holly Baxter said it’s important for people here to see this work. "We wanted to make sure that [Song's] message of freedom and democracy was made visible and that we provided him with a platform," Baxter said. “We are honored to exhibit the work of Song Byeok, an innovative artist whose work plays on the humorless propaganda of the Kim regime," Baxter writes in a statement on the gallery's website. "Song has transformed his insider knowledge into an incisive critique of government repression, infused with absurdity and references to pop culture." For Song himself — who fled from North to South Korea in 2002 after being released from prison, where he'd been tortured and incarcerated for attempting to escape to China to find food during a famine — it is more important for his work to reach North Koreans than Americans. 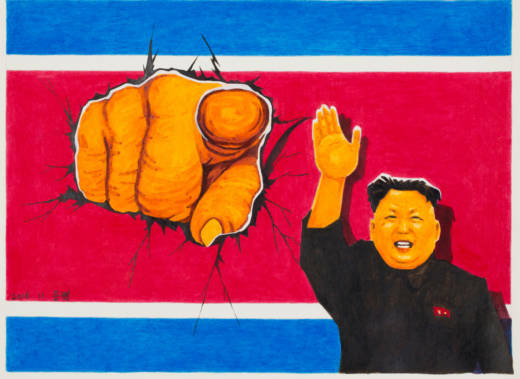 "I want to deliver a message to North Korean people," the 47-year-old artist said. "I want to let Kim Jong Un know that he should allow freedom of art and freedom of religion to his people." That’s not an easy proposition. There are few, if any, North Koreans in the Bay Area. And it’s not like those back home have easy access to the internet or social media. The Human Rights Foundation, the nonprofit organization behind exhibiting Song's show at the Minnesota Street Project, is also showcasing an interactive installation called "Flash Drives for Freedom," a collaborative project to send USB flash drives packed with content from outside North Korea into the country, using drones and other methods. Content on the flash drives includes South Korean soap operas, Hollywood movies, Korean-language versions of Wikipedia and interviews with North Korean defectors. The North Korean government strictly prohibits access to foreign information and media. The organizers haven't yet included digital images of Song's work in the mix, but they are considering it. While airdropping contraband materials into North Korea might not incur great risk for the sender, possessing a USB flash drive loaded with this content comes with serious repercussions. "People need to have full knowledge of what's on the USBs so they can evaluate for themselves if they risk taking one," said Martyn Williams, an expert on North Korean media with the Stimson Center, a nonprofit think tank. "I've heard that in some places people won't pick up USBs dropped by the roadside because they can't risk getting caught with them. I also worry about the regime's efforts to install trackers on the USBs and eventually figure out every computer or phone that has been near them." For his part, Song said he hopes to get his message across to North Korean nationals permitted to work in places outside North Korea, like China. He said these people have internet access, so they could view his work online. But so far he hasn't had any art shows in China. Before coming to San Francisco, "Longing for Freedom" was previously exhibited in Los Angeles, and plans are currently being developed to take it to other cities. Song Byeok’s “Longing for Freedom” runs through Nov. 30 at Minnesota Street Project in San Francisco.